Citation: Sandhaus, Evan. The New York Times Annotated Corpus LDC2008T19. DVD. Philadelphia: Linguistic Data Consortium, 2008. Over 1.8 million articles (excluding wire services articles that appeared during the covered period). Over 650,000 article summaries written by library scientists. Over 1,500,000 articles manually tagged by library scientists with tags drawn from a normalized indexing vocabulary of people, organizations, locations and topic descriptors. 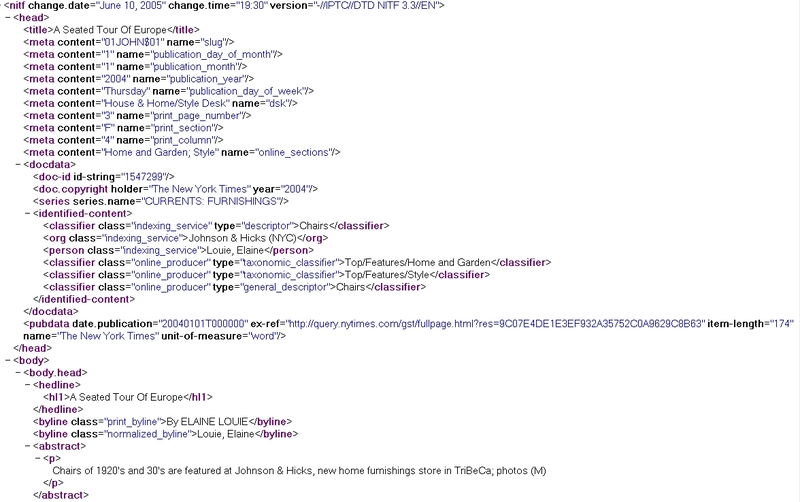 Over 275,000 algorithmically-tagged articles that have been hand verified by the online production staff at nytimes.com. Java tools for parsing corpus documents from .xml into a memory resident object. As part of the New York Times' indexing procedures, most articles are manually summarized and tagged by a staff of library scientists. This collection contains over 650,000 article-summary pairs which may prove to be useful in the development and evaluation of algorithms for automated document summarization. Also, over 1.5 million documents have at least one tag. Articles are tagged for persons, places, organizations, titles and topics using a controlled vocabulary that is applied consistently across articles. For instance if one article mentions "Bill Clinton" and another refers to "President William Jefferson Clinton", both articles will be tagged with "CLINTON, BILL". The New York Times has established a community website for researchers working on the data set at http://groups.google.com/group/nytnlp and encourages feedback and discussion about the corpus. The text in this corpus is formatted in News Industry Text Format (NITF) developed by the International Press Telecommunications Council, an independent association of news agencies and publishers. NITF is an XML specification that provides a standardized representation for the content and structure of discrete news articles. NITF encompasses structural markup such as bylines, headlines and paragraphs. The format also provides management attributes for categorizing articles into topics, summarization usage restrictions and revision histories. The goals of NITF are to answer the essential questions inherent in news articles: Who, What, When, Where and Why. Who: Who owns the copyright, who has rights to republish the article and who the article is about. What: The subjects reported, the named entities inside the article and the events it describes. When: When the article was written, when it was issued and when it was revised. Where: Where the article was written, where the events took place and where it was delivered. Why: The metadata describing the newsworthiness of the article. Please view the following sample. A revised manual is now available.